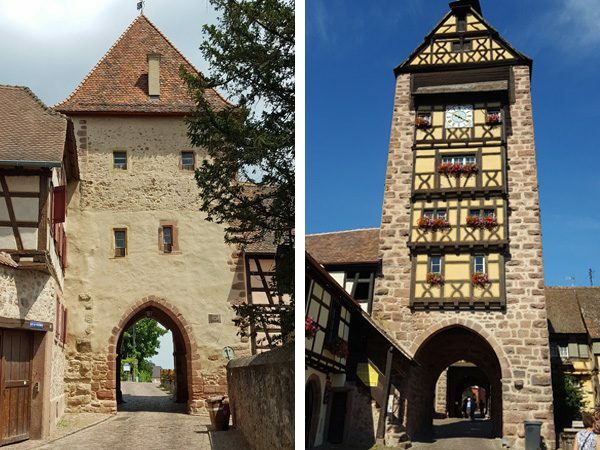 We’re still savoring the memories of our two recent groups in Alsace, a unique region of France located across the Rhine River from Germany. 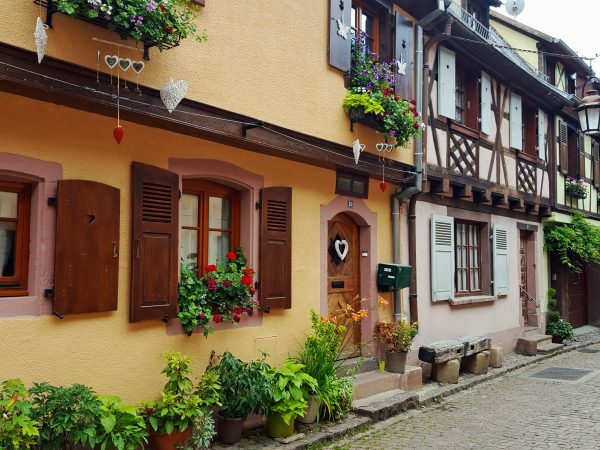 Alsace is a colorful, happy and prosperous region with about 32,000 acres of vineyards tumbling down the hillsides and the lower slopes of the Vosges mountains. 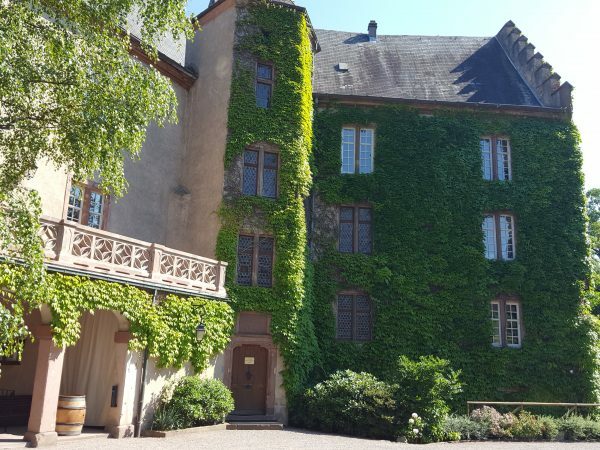 The region is best known for its white wines: Rieslings, Sylvaners, and Gewurtzraminers, wines not produced anywhere else in France. Our family made our first visit to Alsace in 1999, and this was our third year welcoming European Experiences groups to this beautiful and interesting area. 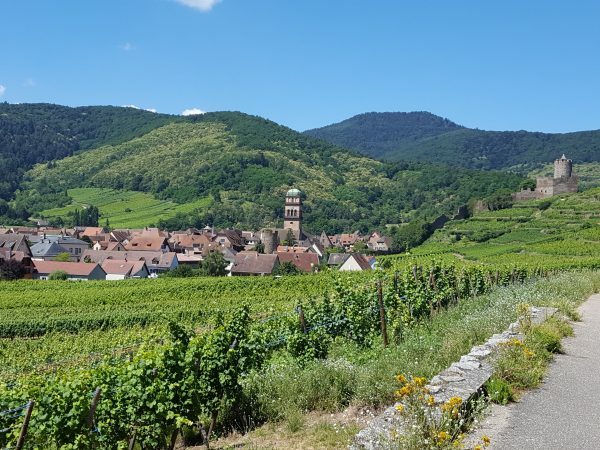 We’re looking forward to our 2019 Alsace Experience week and will also offer this trip in 2020. 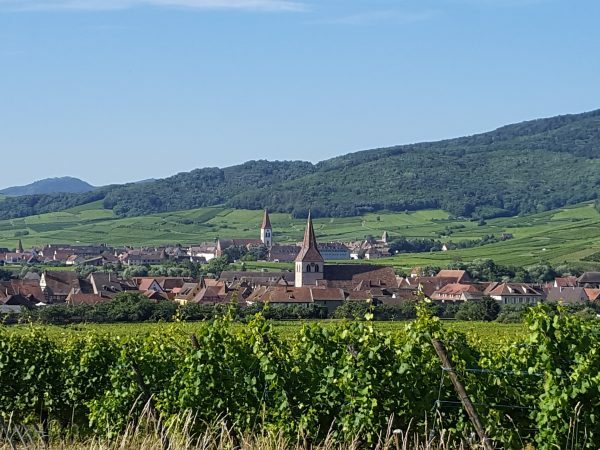 Despite the very cheerful environment today, the history of Alsace is a tumultuous one. The region shifted back and forth between Germany and France in three wars and has changed hands four times since 1870. Alsace was occupied by Nazi Germany in 1940, and 130,000 young Alsatian men were forcibly conscripted into the Nazi army against their will. Several villages in the area where our trip is based were destroyed or badly damaged during the three-month “Battle of the Colmar Pocket” from December 1944 to February 1945 before the area was fully liberated by the French and American forces. Alsace was returned to France after the war. 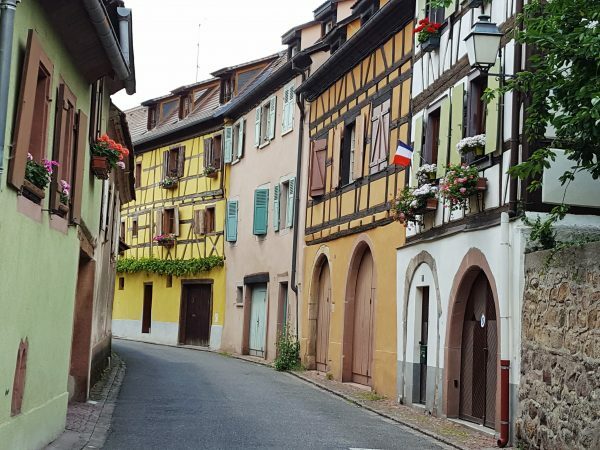 The people of this region have a strong identity as Alsatians but are very definitely French– not German! 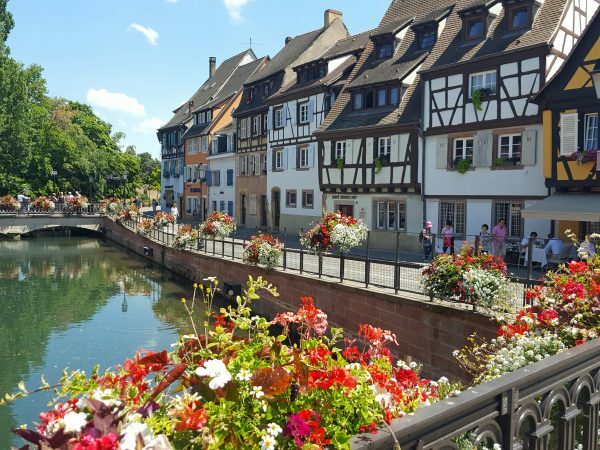 However, because of this unique history, visitors to this area experience both French and German influences in Alsace’s architecture, culture, cuisine, and traditions. It’s unlike any other part of France! 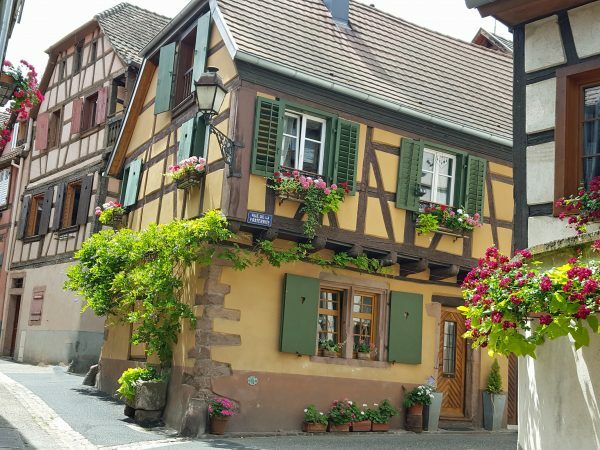 As our groups visit villages and towns in Alsace, they’re enchanted by the colorful and picturesque architecture, very Germanic in its style. 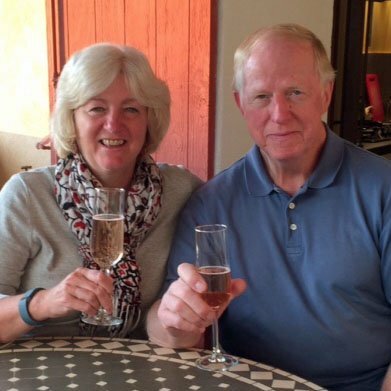 Many people in our groups say the villages are like something in a fairy tale. 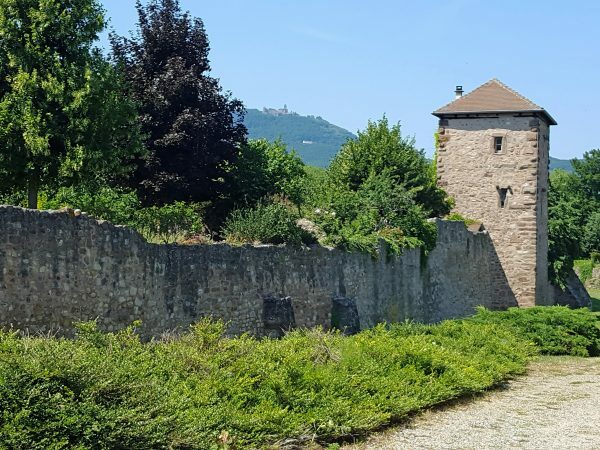 In the southern part of Alsace, most villages are surrounded by remains of medieval walls, pierced by gates and towers. The villages were built with houses, wineries, shops, and the church (sometimes both a Catholic and a Protestant church) inside the walls. Public squares provided market and gathering places, often with public fountains. Houses in the Alsace plains were traditionally positioned close together, each with an enclosed courtyard not directly accessible from the street. These courtyards once housed wine-making and farming activities or artisan workshops; today those that remain provide private gathering places for families and friends. 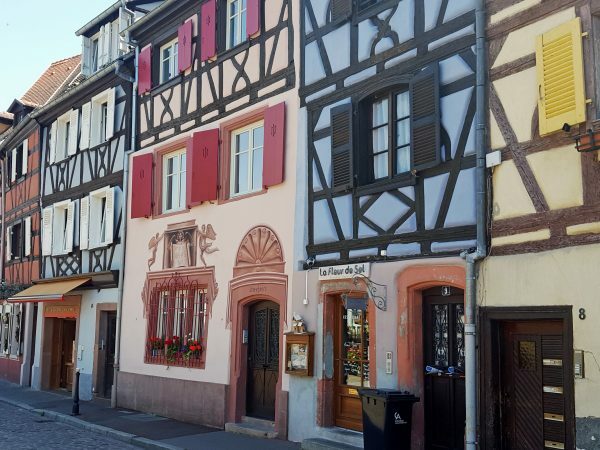 A typical Alsatian house is “half-timbered” and often includes symbols and decorations on porches, shutters, doors, and wood timbers. Hearts are especially popular. 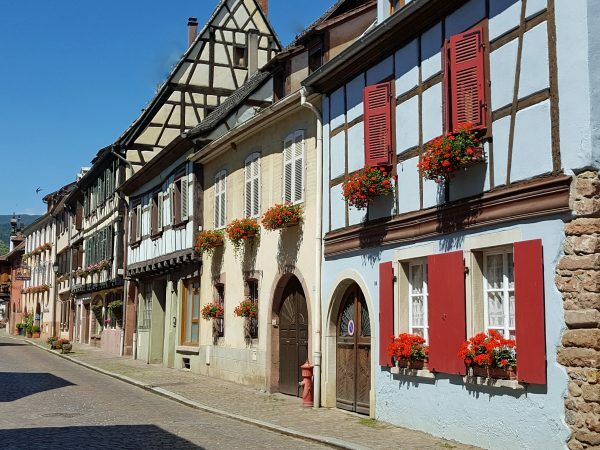 Today regional authorities provide financial grants to homeowners who paint houses in a rich variety of colors to preserve the picturesque quality of Alsatian towns and villages. 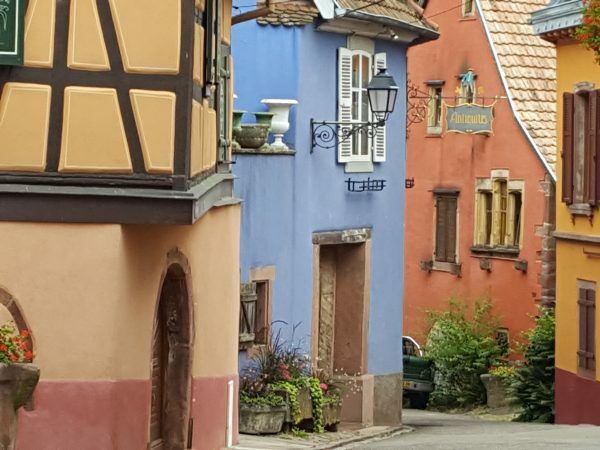 Colorful houses in Niedermorschweier, a little village with a big name! 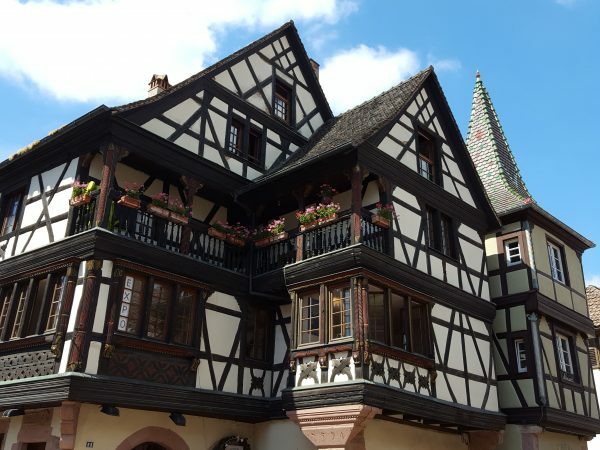 Due to the climate, the roof of the typical Alsace property is usually steeply pitched (up to 60 degrees) and the typical roof is covered with flat clay tiles specific to Alsace and some neighboring areas of France. Wood was frequently used in house construction because the Vosges mountains were nearby and wood was plentiful. However, fire was also a risk, so the ground floor was typically made of stone and the upper floors in half-timbering. In this type of construction, external and internal walls were constructed of timber frames of different designs and the spaces between the frames filled with materials such as brick, stone or plaster. In many buildings, the second story has an overhang which provides slightly more floor space on the second story. A basement level provided a large wine cellar. Some villages included chateaus within the walls; the village of Kientzheim where we base our trip had three! Wealthy and powerful people had more elaborate houses with turrets, oriel window, and enclosed balconies. These houses often have intricate decorations on their exterior. 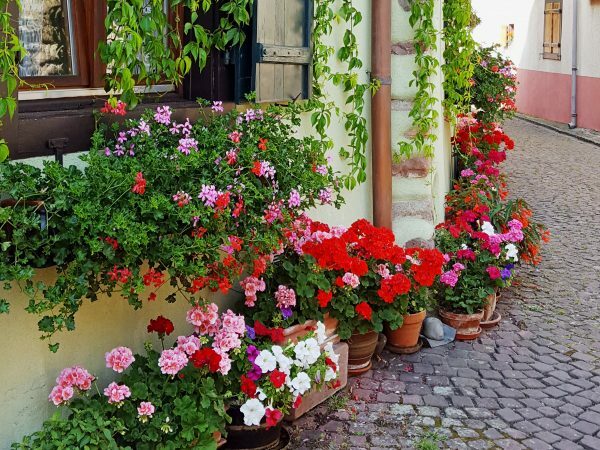 Today most of the villages and private homes are abundantly landscaped with flowers, adding to the colorful impression. 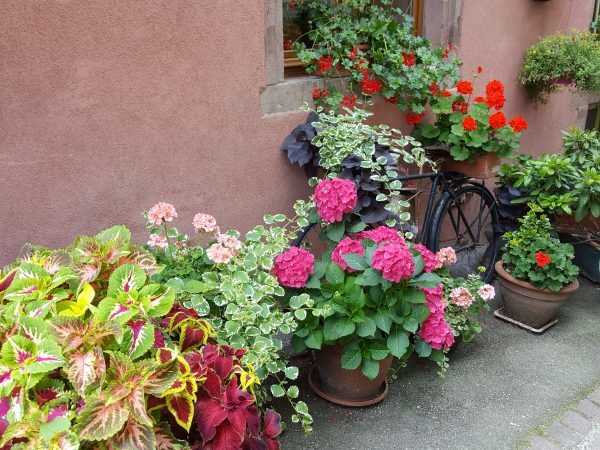 There may not be much grass inside the walled villages, but planters, pots, window boxes, and hanging baskets overflow with flowers. Geraniums are especially popular. 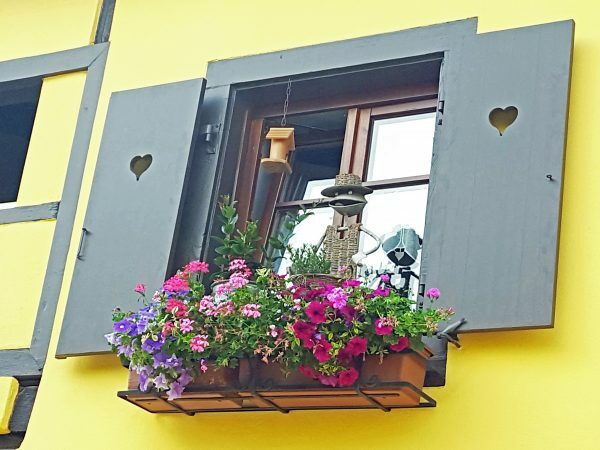 Many of the Alsatian towns and villages are recognized as a Ville or Village Fleuris (town or village “in bloom”) for their use of flowers, their landscaping, and overall cleanliness. This is a program administered across France. 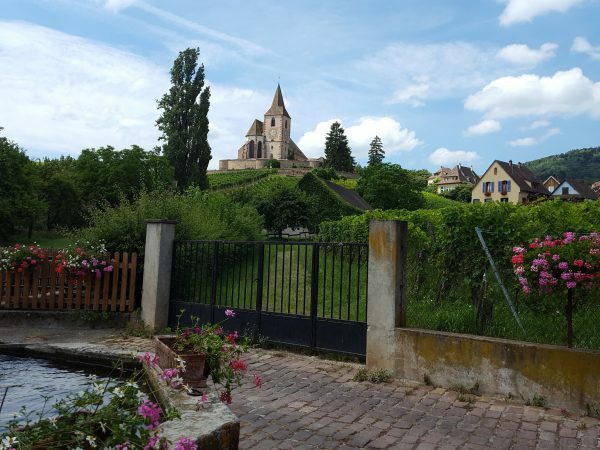 The “Haute-Rhin” department where our Experience week is based has 158 villages recognized with this designation, each awarded one to four flowers. We visit 10 of these villages during our week. 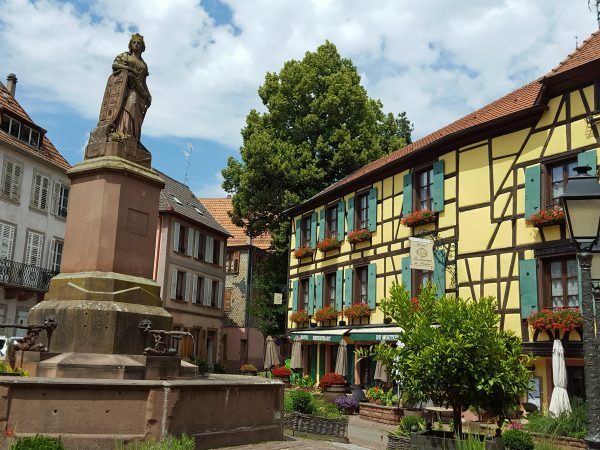 Learn more about our Alsace Experience week here. 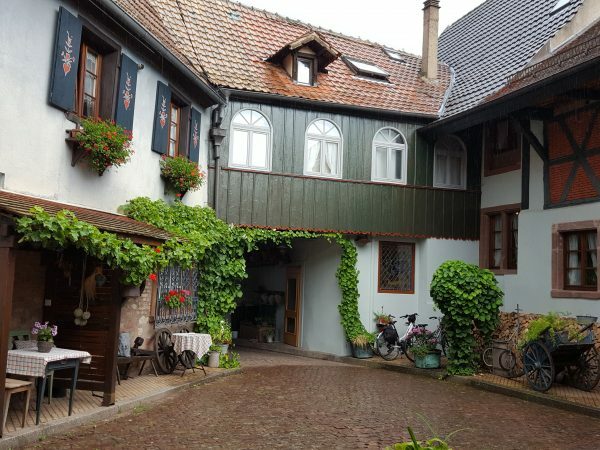 Our base is the authentic village of Kientzheim, near Kaysersberg. We learn about the history of this interesting region, visit these charming villages and towns, enjoy the delicious food and world-famous wine, and experience the culture and traditions. 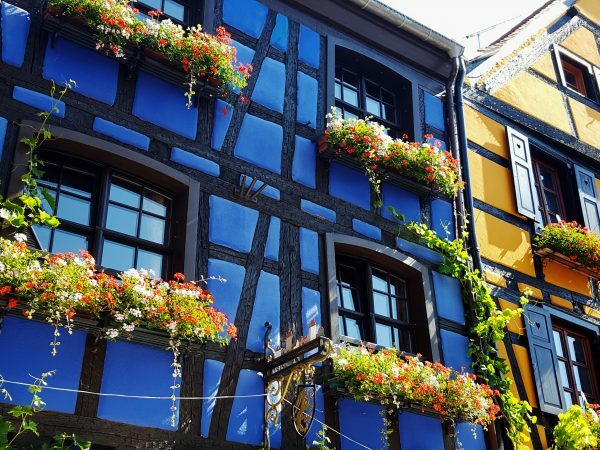 We’d love to have you join us in colorful, flower-filled Alsace! !